A blog about fashion, beauty, traveling, and other fun stuff and cool places. Today is time for a mini beauty haul. I needed/wanted a few things so I got them the last 2 weeks. The first item I got is the L’oreal Sublime Soft Eau Micellaire (dry or combination skin). I got this because I am running out on my Bioderma Eau Micellaire. I do like the Bioderma one, but I wanted to try out some other ones as well and the best thing is that the one from L’oreal only was around 4,50€, where the Bioderma one is around 17€. The second product I bought is from Qiriness, it is the Elixir Eclat Parfait. This product is a serum for anti-redness and anti-spots. It’s supposed to get rid of any redness and dark spots. Lately I suffer from redness on my cheeks, and I hope by using this it will calm my skin and reduce the redness. I bought this one instead of the Estee Lauder Even Skintone Illuminator. Because the Illuminator from Estee Lauder is supposed to put a little bit of glow on your skin, and I try to avoid that because I have a combination to oily skin. The next product is a lipstick from Mac and it is in the color Amorous (AB2). It is a satin finish lipstick. I was looking for a darker berry-colored lipstick and I went to Mac to look for one. I tried out a few colors, but this one looked nicest. Because my skin is somewhat lighter in the winter I didn’t want a color that was to dark. This one is just perfect. It is a nice berry color that is not to dark. The last product that I bought is the Longlasting eye pencil waterproof in Moss undercover. It is a darker metallic green color. I always use a black one, and I wanted to try out something else. Since the darker green is a fall/winter color I wanted to give that one a try. 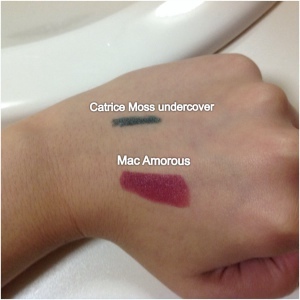 I already used the black one from Catrice and I like the product, so that is why I got their green one. Don’t forget to like, comment and subscribe (maybe even share) when you liked it and want more of these blogposts! 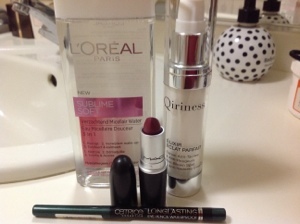 This entry was posted in beauty and tagged Catrice, eau micellaire, eye pencil, l'oreal, lipstick, mac, mini beauty haul, qiriness, serum by missnathaliexo. Bookmark the permalink.